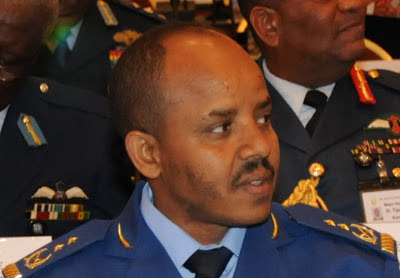 November 06, 2012 — General Molla Hailemariam, the commander of the Ethiopian Air Force, has been fired from his post and replaced by General Mehari Tekele, according to U.S.-based opposition websites and sources within Addis Ababa. General Molla, who is of the Amhara ethnicity, was sacked by Communications Minister Bereket Simon, after he had complained of unfair favoritism for Tigrayans in the military who are being promoted based on their ethnicity over more qualified candidates. Bereket, who has become the unofficial ruler of Ethiopia after the demise of former dictator Meles Zenawi, is reportedly purging military officials who fail to show absolute loyalty to his TPLF faction, a source familiar with the situation informed Durame by phone. Last September, in a bid to consolidate power, Bereket appointed thirty-four colonels to the rank of brigadier general and three colonels to major generals, who were all reported to have been of the Tigrayan ethnicity that caused resentment among non-Tigrayan military officials. Despite the Tigray ethnic group consisting of less than six percent of Ethiopia's population, they hold nearly all the senior banking, political and military positions in the country. Some observers have described Ethiopia's extreme minority ethnic hegemony as a powder keg destined to ignite.